A Tenchi Muyo! special staring the galaxy's most bubbleheaded policewoman! What could be funnier? When Mihoshi is questioned about her qualifications as a Galaxy Police officer, she relates to the rest of the Masaki clan her part in the most famous case in Galaxy Police history. 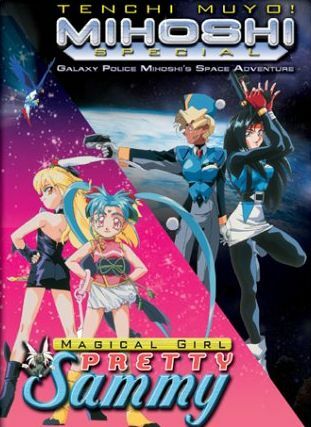 Using the clan as cast members in her adventures, Mihoshi, along with her partner Kiyone, go racing around the galaxy trying to find out who's been stealing all the ultra-energy matter. What they find out is a plot to destroy the universe! Hold on tight! This is one ride that is sure to thrill! Here is an episode that centers on the Masaki clan's bubbleheaded, but cherry space detective in her most famous case. This story marks the only OVA appearence of Kiyone, as well as the debut of Pretty Sammy.